Founded in 2007, Omar Bookstore was one of the first independent bookstores to appear in downtown Cairo, following on the heels of Diwan’s success over in Zamalek. 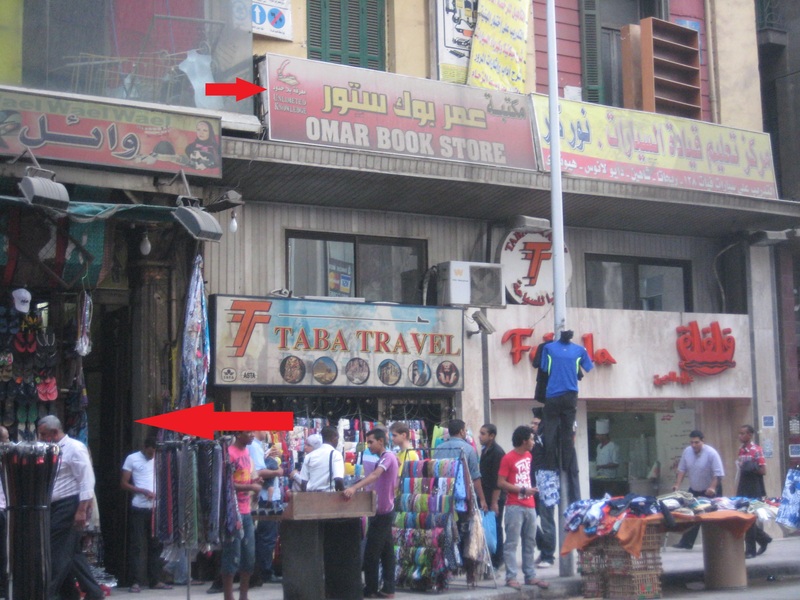 The bookstore was founded by Omar Said Muhammad, who remains the owner, though you’re more likely to find him in Tahrir Square where continues his father’s and grandfather’s trade of selling newspapers and books at a sidewalk stand. The decision to open a bookstore seemed like a natural extension of his profession of selling and distributing newspapers, journals, magazines, and books, and Muhammad opened his store on Talaat Harb with a desire to spread culture to anyone interested in buying a book. While the store has grown since its opening and now has at least two full-time employees who are responsible for purchases and sales, respectively, it does not have a large, off-site warehouse. Thus the store only initially purchases about 10 copies of a new book to make sure it sells before buying in larger quantities, which means you may want to call ahead to make sure the book is in stock. Though the store itself is small, almost from the beginning Omar Bookstore has worked in cooperation with several different publishing houses and writers to promote new releases, host signing parties at off-site locations, and organize talks with authors. While you almost have to know it’s there to find it nestled above Felfela take-away, with the entrance to the building almost shrouded in colorful scarves, Omar Bookstore is worth tracking down. The bookstore isn’t very large, but they fit an impressive number of titles in the space they have. Moreover, Mohammad Abdelazim Hussin and Ayman Mansour are happy to help you track down a title (if they can), whether by locating it immediately on the ever-changing bookshelves they have memorized, calling a neighboring store or publisher to run over a copy for you, or ordering the desired title with a promise to call you as soon as it’s in. As with other independent bookstores, at Omar Bookstore you’ll find only a smattering of government publications due to the difficulty of working with what has been described as endless paperwork and bureaucracy, as well as small returns. This bookstore currently has only one branch. Mohammad and Ayman talk vaguely of plans to expand, but nothing is in the works as of yet. The current store carries more than 100 different publishers, the vast majority of which are Egyptian, though they also carry a fair number of books put out by Lebanese and Syrian publishing houses, in addition to a handful of representatives from other Arab states. When you enter the store, literary works greet you on the wall immediately in front of you and to your right, with bestsellers and prizewinners at eye-level, as well as the latest edition of the monthly graphic magazine Tok-Tok, if it hasn’t yet sold out. Continue into the store and you’ll find the first aisle to your right also filled with literature, organized here primarily by publishing house. Like several other Cairo bookstores, Omar Bookstore has a membership program that’s worth checking out, especially early in the year (and if you’re a regular enough customer you tend to become an honorary member). The membership program runs January through December, costs 25 LE, and provides a 15% discount on every book purchased from the store.